Politics is the activity they are doing to create, maintain and change the general rules in which people live as a subject. In this respect, mainly politics is a social activity that is linked in a complex way to the existence of difference and conflict, on the one hand, and on cooperation and collective action on the other. In order to understand politics in the most correct way, it is necessary not to see it as an action that solves or solves all conflicts, but as an effort to resolve conflicts beyond achieving it. In Libya, the dynamics of religion, tribalism, oil and ideology have always been dominant. Libya is trying to establish a new order in the political arena in which Gaddaffi term ends and NATO intervention is in all areas. This process, which has been going on with painful and various serious difficulties, is already carried out with a certain system. The aim of this study is to examine the current political practices of Libya and the state administration process and to examine the past and present administrative processes of the management processes that have been found in the social and cultural structure of the Libyan society and make proposals for the future application of the ideal political system. Aksoy, M., Ateş, D., Akyeşilmen, N. & Çemrek, M. (2013). Uluslararası politika-II (International politics-II). Eskişehir: Anadolu University. Alfasi, K. (2016). Democratic Backsliding and the Role of the Military in post-Qadhafi Libya, Is Democracy Decline. Democracy and Society, Georgetown University, 13 (1), 5-17. Alsari, A. B. (2017). National reconciliation and political stability Libya. Unpublished master’s thesis, Karabuk University. Apap, J. (2017). Political developments in Libya and prospects of stability. European Parliamentary Research Service. Blanchard, C. (2018). Libya: transition and US policy. Congressional Research Service. Bölme S., Ulutaş U., Özhan T. & Küçükkeleş M. (2011). İsyan, müdahale ve sonrası: Libya’da dönüşüm sancıları (Rebellion, ıntervention and aftermath: transition causes in Libya). Seta Report. Chivvis, C. & Martini, J. (2014). Libya after Qaddafi, lessons and ımplications for the future. National Security Research Division. Anderson, R. (Ed.) (2013). How the local matters, democratization in Libya, Pakistan, Yemen and Palestine. Danish Institute for International Studies, Kopenhagen. Doğan G. & Durgun B. (2012). Arap baharı ve Libya: tarihsel süreç ve demokratikleşme kavramı çerçevesinde bir değerlendirme (Arab spring and Libya: an evaluation on the concept of historical process and democratization). Journal of Süleyman Demirel University Institute of Social Science, 1 (15), 61-91. Eltweni, A., Y. (2016). Libyan spring or fall: four decades of tyranny and unity four years of fragmentation. Unpublished master’s thesis, Karabük University. Friesen, J. (2013). Tribes and revolution; the “social factor” in Muammar Gadhafi’s Libya and beyond. Unpublished master’s thesis, McGill University, Canada. Genugten, S. V. (2011). Libya after Gadhafi. Vrije University, Brusells. General National Congress (GNC) Election Report. (July 7, 2012). Retrived 28.12.2017, from www.cartercenter.org. Grant, G. (2011). Libya’s transition to democracy: an assessment with recommendations for British foreign policy. The Henry Jackson Society. Hajjar, S. (1980). The jamahiriya experiment in Libya: Qadhafi and Rousseau. The Journal of Modern African Studies, 18 (2), 181-200. Heywood, A. (2004). Political theory. Third Edition, Palgrave Macmillan Publications. Heywood, A. (2014). Politics. Second Edition, Palgrave Publications. Imam, M., Abba, S. & Wader, M. (2014). Libya in the post Ghadaffi era, The International Journal of Social Sciences and Humanities Invention, 2 (2), 1150-1167. Kalaycıoğlu, E,. Oktay C., Sayarı S., Retornaz E. A., Hatipoğlu E., Bilgin H. D. & Kağnıcıoğlu D. (2013). Karşılaştırmalı siyasal sistemler (Comparative political systems). Eskişehir: Anadolu University. Ladjal, T. (2016). Tribe and state in the history of modern Libya: a khaldunian reading of the development of Libya in the modern era 1711-2011. Arts & Humanities, 1-17. Laurea, T. D. (2012). Libya before and after Gaddafi, an international law analysis. Unpublished master’s thesis, University of Ca’Foscari Venezia. Libya Working Group (LWG) Report: MENA Programme (2011). Libya: challanges after liberation. Chatham House. Mangan, F. & Murtaugh, C. (2014). Security and justice in postrevolution Libya, where to turn?. Security Asssesment in North Africa. McGlynn, N. (2016). Statelessness in Libya before and after the fall of Qaddafi. Unpublished master’s thesis, Leiden University. Metz, H. C. (1987). Libya: A historical and cultural overview. Retrived 28.12.2017, from http://countrystudies.us/libya/. Mikail, B. (2012). The multiple challenges of Libya’s reconstruction.Policy Brief, No.114, 1-5. Munroe T. (2002). An introduction to politics. Canoe Press. Okpanachi E. (2013). Introduction to political analysis course notes. National Open University of Nigeria. Omagu, D. & Odigbo J. (2017). Democracy and the struggle for democratisation in Libya. Socialscientia Journal of the Social Science and Humanities, 2 (1), 30-46. Perroux, J.-L. R. (2015). Libya’s untold story: civil society amid chaos. Middle East Brief, No.93, 1-9. Rynn, J. (2001). The power to create wealth: a systems-based theory of the rise and decline of the great powers in the 20th century. Unpulished dissertation, The City University of New York. Sawani, Y. M. (2012). Post-Qadhafi Libya: Interactive Dynamics and The Political Future. Contemporary Arab Affairs, 5 (1), 1-26. Şaylan G. (1981). Çağdaş siyasal sistemler (Contemporary political systems). TODAİ institute Publications. Tuncer, C. (2017). Analysis of the Libyan crisis within the framework of the internationalization of the state concept. Unpulished master’s thesis, Hacettepe University. Smiths R., Jannsen F., Briscoe I. & Beswick T. (2013)., Revolution and ıts discontents: state, factions and violence in the new Libya. Netherlands Institute of International Relations. ISNAD YURTSEVER, Serdar , SAID, Abdulkarim . "AN ANALYSIS ON THE FUTURE OF LIBYAN POLITICAL SYSTEM". 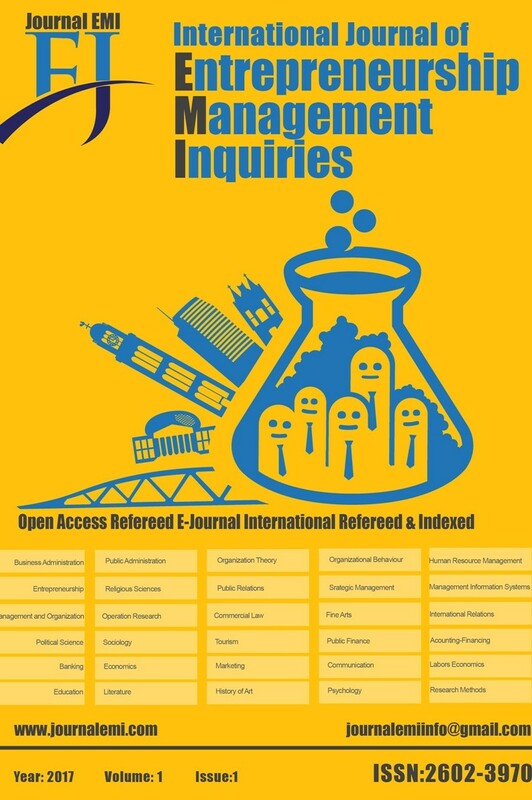 International Journal of Entrepreneurship & Management Inquiries (EMI) 2 / 3 (December 2018): 16-32.